This is a book for genuine banjo lovers. 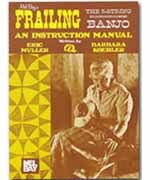 Full of beautiful photos and hand-sketched tabs, this highly acclaimed text presents a systematic method for playing the unique 'frailing' banjo style. 'Old-time mountain banjo' is taught with clarity and expertise. In tablature only. The compact disc is in split-track format, allowing the student to play along with the old-time string band or the frailing banjo parts. It also includes Eric Muller's concise teaching.